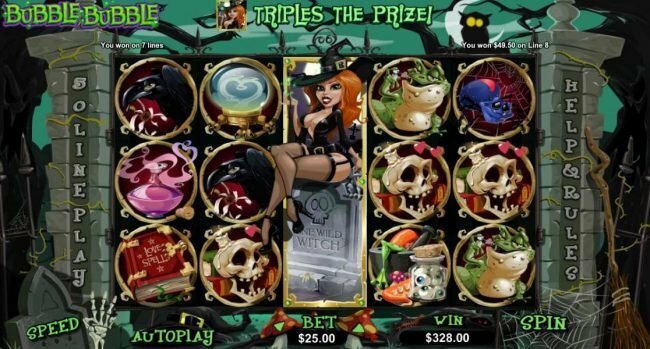 Bubble Bubble is a 5 slot reel online slot machine with a top payout of $15,000 using the witches and wizards halloween magic theme. 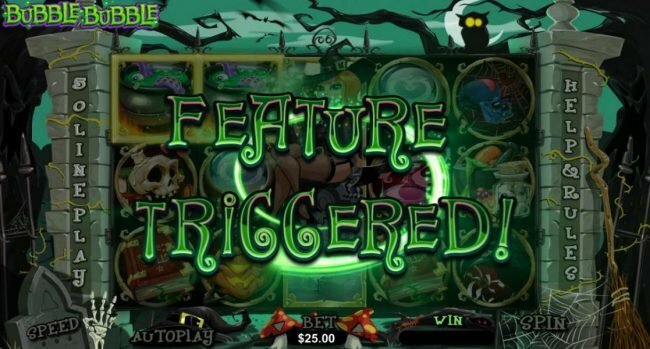 Bubble Bubble Slots has not been reviewed yet, be the first to rate this slot. 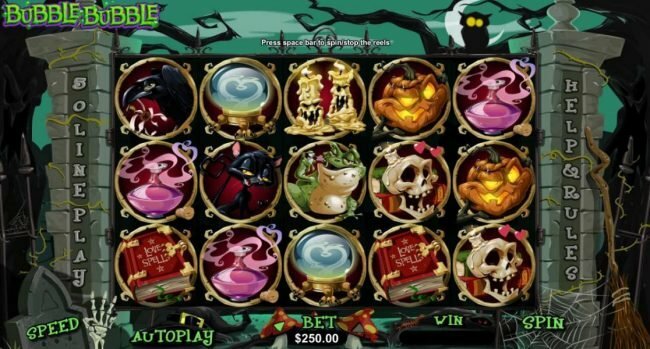 Bubble Bubble is a Halloween themed video pokie from Realtime Gaming, which presents the thrilling winning opportunities an amazingly well developed theme and animated symbols appearing in a cartoon manner. 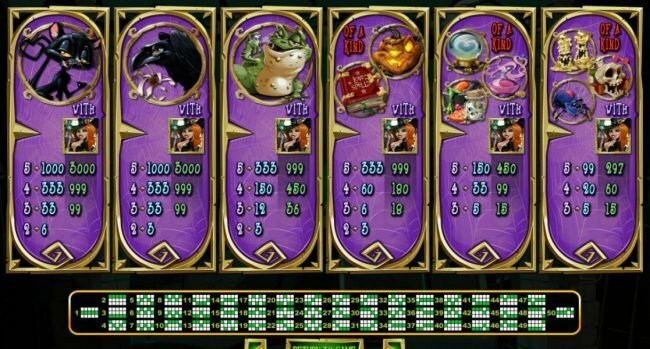 The game provides a massive 50 pay lines, which are sure to capture every combination appearing on 5 reels. 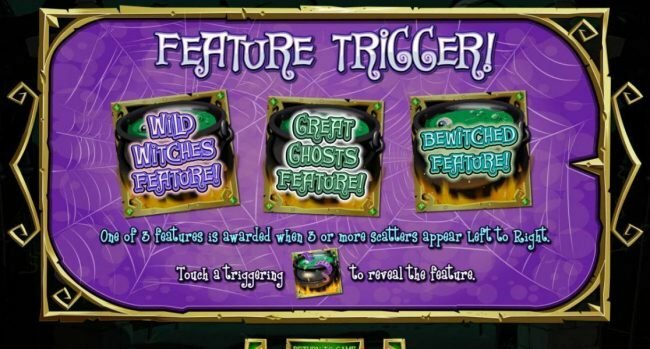 Bonus features include wild symbols that can expand, scatter symbols rewarding multipliers and a free spin bonus feature. Winning opportunities range up to 5,000 coins, which is 100 times your bet total. The theme presents a graveyard in the middle of the night. The broken gate leading into the graveyard hold the reels and all it symbols. In front of the gate gravestones, mushrooms and spider webs can be seen on which all your betting options and game information will appear. Behind the reels leafless trees are scattered all over the greens sky, white moon and the owl with bright yellow eyes. The symbols include everything you expect with Halloween, which begins with a Jack o’ lantern, skeleton, scary spiders, potions and cauldrons. Betting options allow players to achieve the winnings they want. Every player will have the ability to spin the reels and be entertained by the incredible features offered. Each of the lines require a minimum bet of $0.01 and a number of lines cannot be adjusted. This means your total minimum bet is $0.50, which can be increased up to $5.00 per line. With this increase, 500 times higher payouts will be granted for every single combination. The wager will be increased to a maximum of $250.00 per spin, but you will also find many values can be selected between those mentioned. The witch with the red hair sitting on the grave and winking at you will provide the wild symbol. She can only be seen on reel three with the ability to cover the entire reel and offer more winning opportunities. Each symbols covered by her will have the ability to represent other symbols, which excludes only the scatters. The wild symbol appears on a regular basis and will triple the prizes she is featured in. The golden symbols with the green tentacles is used to activate the free spin feature. The symbols are scatters and can appear in any position to activate the bonus game. The free spin Bonus offers three different features to increase winning opportunities. 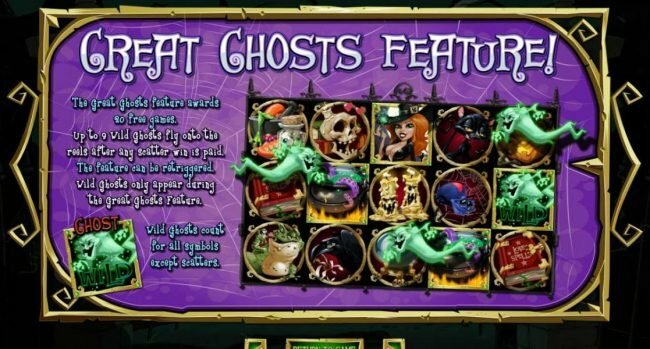 The great ghosts feature presents 20 Free Spins and additional wild symbols when the scatters appear on the reels. The ghost symbol will represent the wilds and can appear up to 9 times in a single spin. 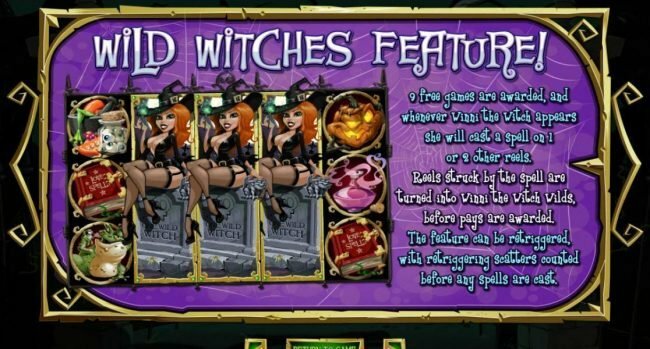 The wild witches feature will guarantee at least 10 times your wager total. 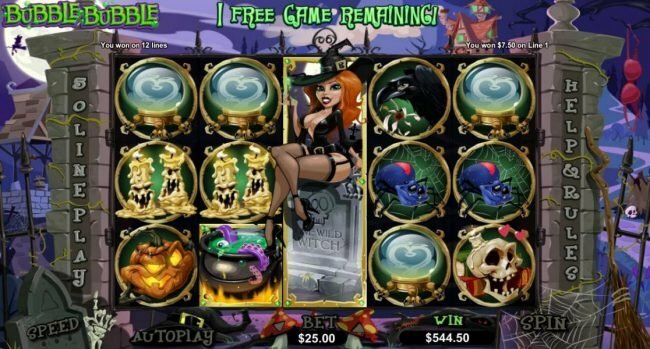 The game offers nine free spins and presents the witch with the ability to expand to an additional two reels each time she appears. Should know winnings be obtained had during the free spin feature, the game will reward 100 times your bet total. 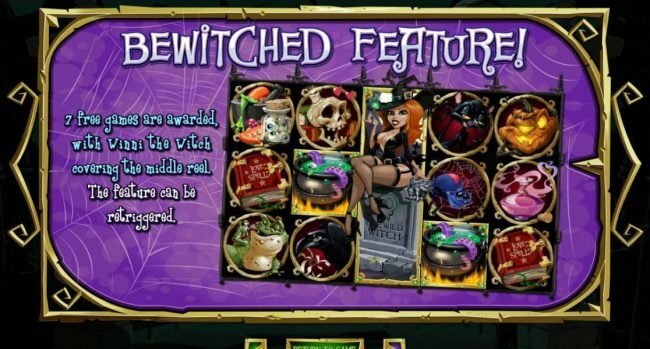 The bewitched feature provides you with seven free spins and sticky wilds on reel three. This means the third reel will remain wild for the duration of the feature. 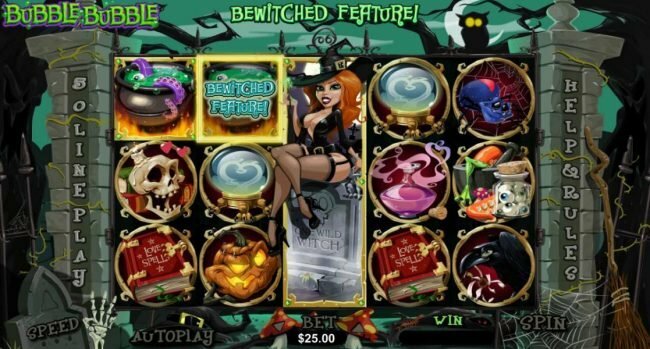 Bubble Bubble is a rather strange name for a Halloween themed video pokie, but players will be pleasantly surprised as the winnings appear on the reels. This is definitely a very entertaining game for anytime of the year. Be sure you do not use more than one free Casino Bonus back to back as your balance may be voided without a deposit. Do not use more than one free promotion at Uptown Aces as your winnings could be removed without making a deposit. Be sure when you use a no deposit bonus code from Grande Vegas casino as you know with RTG operated casinos, you must make a qualifying deposit if the last Casino Bonus was a free one. Do not use more than one free bonus at Cool Cat as your balance may be removed without a deposit. Do not use more than one no deposit bonus at Wild Vegas as your winnings could be voided without a deposit. Wild Vegas Casino is restricted in American Samoa, Andorra, Anguilla, Aruba, Barbados, Belgium, Bermuda, British Virgin Islands, Cayman Islands, Chile, Cook Islands, Greece, Iceland, Luxembourg, Marshall Islands, Martinique, Mayotte, Mexico, Monaco, Montserrat, New Caledonia, Niue, Northern Mariana Islands, Portugal, Puerto Rico, San Marino, Spain, Sweden, Tokelau, Uruguay and Venezuela countries. Take care you do not use multiple Free Casino Bonuses back to back at Fair Go as they may not pay you for not following the rules. Note that Bulgaria, Costa Rica, Denmark, Israel, Oman, Poland and Ukraine players are not allowed to play at Fair Go. Be sure you do not use multiple free promotions as your winnings could be removed without making a deposit. Be sure when you use a free Casino Bonus code from Casino Extreme casino as you know with RTG operated casinos, you must post a qualifying deposit if the last bonus was also a free one. Be sure when you use a free bonus code from Captain Jacks as you know with RTG operated Online Casinos, you have to make a qualifying deposit if the last bonus was a no deposit one. Fair Go terms state that you must make a qualifying deposit between No Deposit Casino Bonuses to be able to process a cash out. Be sure when you use a free bonus code from Captain Jacks Casino as you know with RTG run Online Casinos, you must make a qualifying deposit if your last casino bonus was also a no deposit one. Do not use multiple no deposit promotions at Slotastic as they may not pay you for not following the rules. Be sure when you use a free Casino Bonus code from Cherry Gold casino as with most RTG operated Online Casinos, you have to post a qualifying deposit between free Online Casino promotions. Do not use more than one no deposit bonus at Captain Jacks as your balance may be voided without a deposit. Grande Vegas terms state that you have to make a qualifying deposit between No Deposit Casino Bonuses to be qualified to process a withdraw. Take care you do not use more than one free promotion back to back at Grande Vegas as they may not pay you for not following terms. Captain Jacks requires that you have to make a deposit between no deposit bonuses to be able to process a cash out. Wild Vegas requires that you must make a deposit between no deposit bonuses to be allowed to make a cash out. Note that American Samoa, Andorra, Anguilla, Aruba, Barbados, Belgium, Bermuda, British Virgin Islands, Cayman Islands, Chile, Cook Islands, Greece, Iceland, Luxembourg, Marshall Islands, Martinique, Mayotte, Mexico, Monaco, Montserrat, New Caledonia, Niue, Northern Mariana Islands, Portugal, Puerto Rico, San Marino, Spain, Sweden, Tokelau, Uruguay and Venezuela players are not able to play at Wild Vegas casino. Do not use multiple free Bonuses as your balance could be removed without making a deposit. Note that American Samoa, Andorra, Anguilla, Aruba, Barbados, Belgium, Bermuda, British Virgin Islands, Cayman Islands, Chile, Cook Islands, Greece, Iceland, Luxembourg, Marshall Islands, Martinique, Mayotte, Mexico, Monaco, Montserrat, New Caledonia, Niue, Northern Mariana Islands, Portugal, Puerto Rico, San Marino, Spain, Sweden, Tokelau, Uruguay and Venezuela players are not allowed to play at Wild Vegas. Be sure when you use a No Deposit Casino bonus code from Captain Jacks casino as you know with RTG powered Online Casinos, you must post a qualifying deposit if your last bonus was also a free one. Be sure you do not use more than one no deposit promotion at Captain Jacks as your balance could be voided without making a deposit. Be sure when you use a free bonus code from Wild Vegas Casino as with most RTG operated casinos, you are required to make a qualifying deposit between No Deposit Casino promotions. Do not use multiple no deposit bonuses as they may not pay you for not following terms and conditions. Do not use more than one no deposit Casino promotion at Captain Jacks as your winnings could be removed without a deposit. Do not use multiple no deposit promotions at Cool Cat as your balance could be voided without a deposit. Be sure when you use a free bonus code from Captain Jacks as with most RTG run casinos, you must post a qualifying deposit if the last Casino Bonus was a free one. Be sure when you use a free Casino Bonus code from Fair Go as with most RTG powered Online Casinos, you are required to post a deposit between free Online Casino Bonuses. Take care you do not use multiple free casino promotions back to back at Cool Cat as your winnings may be removed without a deposit. Captain Jacks terms state that you have to make a deposit between no deposit bonuses to be qualified to process a cash out. Take care you do not use more than one free Casino Bonus back to back at Fair Go as they may not pay you for violating terms and conditions. Be sure when you use a No Deposit Casino bonus code from Wild Vegas as you know with RTG operated Online Casinos, you must make a deposit between free Casino promotions. Note that American Samoa, Andorra, Anguilla, Aruba, Barbados, Belgium, Bermuda, British Virgin Islands, Cayman Islands, Chile, Cook Islands, Greece, Iceland, Luxembourg, Marshall Islands, Martinique, Mayotte, Mexico, Monaco, Montserrat, New Caledonia, Niue, Northern Mariana Islands, Portugal, Puerto Rico, San Marino, Spain, Sweden, Tokelau, Uruguay and Venezuela players are restricted at Wild Vegas casino. Grande Vegas terms state that you have to make a deposit between free Bonuses to be qualified to make a withdraw. Take care you do not use more than one free casino promotion as they may not pay you for not following terms. Do not use multiple free Bonuses back to back at Kudos as your balance may be voided without a deposit. Be sure you do not use more than one no deposit Casino promotion back to back as your balance may be voided without making a deposit. Fair Go requires that you have to make a qualifying deposit between multiple free Bonuses to be allowed to process a withdraw. Be sure when you use a free Casino Bonus code from Bovegas casino as with most RTG run Online Casinos, you must post a deposit between No Deposit Casino promotions. Do not use multiple free Bonuses back to back at Sloto Cash as they may not pay you for not following terms. Be sure when you use a free Casino Bonus code from Captain Jacks Casino as with most RTG run Online Casinos, you are required to post a qualifying deposit if your last bonus was a free one. Do not use multiple free Bonuses back to back as your balance could be voided without a deposit. Do not use more than one no deposit Casino promotion back to back at Kudos as your winnings could be voided without making a deposit. Do not use more than one no deposit Casino promotion back to back at Wild Vegas as they may not pay you for violating terms. Wild Vegas is prohibited in American Samoa, Andorra, Anguilla, Aruba, Barbados, Belgium, Bermuda, British Virgin Islands, Cayman Islands, Chile, Cook Islands, Greece, Iceland, Luxembourg, Marshall Islands, Martinique, Mayotte, Mexico, Monaco, Montserrat, New Caledonia, Niue, Northern Mariana Islands, Portugal, Puerto Rico, San Marino, Spain, Sweden, Tokelau, Uruguay and Venezuela countries. Captain Jacks terms state that you have to make a deposit between free Bonuses to be able to process a cash out. Take care you do not use more than one no deposit bonus at Slotastic as they may not pay you for not following terms and conditions. Be sure when you use a free Casino Bonus code from Cherry Jackpot casino as you know with RTG run casinos, you must make a qualifying deposit between Free Casino Bonuses. Be sure when you use a No Deposit Casino bonus code from Captain Jacks as with most RTG run Online Casinos, you are required to post a deposit if the last bonus was a no deposit one. Do not use more than one No Deposit Casino bonus back to back as they may not pay you for not following the rules. Wild Vegas casino is prohibited in American Samoa, Andorra, Anguilla, Aruba, Barbados, Belgium, Bermuda, British Virgin Islands, Cayman Islands, Chile, Cook Islands, Greece, Iceland, Luxembourg, Marshall Islands, Martinique, Mayotte, Mexico, Monaco, Montserrat, New Caledonia, Niue, Northern Mariana Islands, Portugal, Puerto Rico, San Marino, Spain, Sweden, Tokelau, Uruguay and Venezuela locations. Cool Cat requires that you must make a deposit between free Bonuses to be qualified to process a withdraw. Note that American Samoa, Andorra, Anguilla, Argentina, Aruba, Barbados, Belgium, Bermuda, Cayman Islands, Chile, Cook Islands, Greece, Guam, Guyana, Iceland, Japan, Luxembourg, Marshall Islands, Martinique, Mayotte, Mexico, Monaco, Montserrat, New Caledonia, Niue, Norfolk Island, Northern Mariana Islands, Portugal, Puerto Rico, San Marino, South Africa, Spain, Swaziland, Sweden, Switzerland, Tokelau, United Kingdom, Uruguay and Venezuela players are not permitted to play at Cool Cat. Be sure when you use a no deposit bonus code from Wild Vegas as with most RTG powered casinos, you have to post a deposit between no deposit Online Casino promotions. American Samoa, Andorra, Anguilla, Aruba, Barbados, Belgium, Bermuda, British Virgin Islands, Cayman Islands, Chile, Cook Islands, Greece, Iceland, Luxembourg, Marshall Islands, Martinique, Mayotte, Mexico, Monaco, Montserrat, New Caledonia, Niue, Northern Mariana Islands, Portugal, Puerto Rico, San Marino, Spain, Sweden, Tokelau, Uruguay and Venezuela countries are forbidden at Wild Vegas. Be sure you do not use multiple free Casino promotions as your balance may be voided without a deposit. Be sure when you use a free Casino Bonus code from Grande Vegas as with most RTG run casinos, you are required to make a qualifying deposit between no deposit Online Casino promotions. Be sure when you use a No Deposit Casino bonus code from Planet 7 as you know with RTG powered Online Casinos, you have to make a deposit between no deposit Casino promotions. American Samoa, Andorra, Anguilla, Argentina, Aruba, Australia, Austria, Barbados, Belgium, Bermuda, British Virgin Islands, Cayman Islands, Chile, Cook Islands, Finland, Germany, Greece, Guam, Iceland, Japan, Luxembourg, Marshall Islands, Martinique, Mayotte, Mexico, Monaco, Montserrat, New Caledonia, New Zealand, Niue, Norfolk Island, Northern Mariana Islands, Norway, San Marino, South Africa, Spain, Sweden, Switzerland, Tokelau, United Kingdom, United States and Venezuela locations are restricted at Planet 7 casino. Grande Vegas requires that you must make a deposit between multiple Free Casino Bonuses to be allowed to process a cash out. Be sure you do not use multiple no deposit promotions back to back as your balance may be voided without making a deposit. Be sure you do not use more than one free bonus as they may not pay you for not following terms and conditions. Be sure when you use a free Casino Bonus code from Slots of Vegas as you know with RTG run casinos, you must post a deposit if the last casino bonus was also a free one. 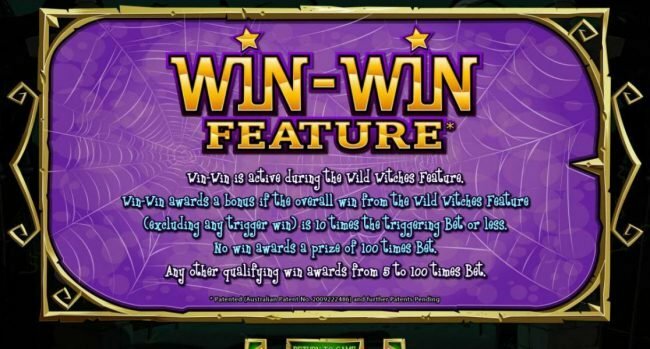 Wild Vegas requires that you have to make a deposit between No Deposit Casino Bonuses to be qualified to make a withdraw. Wild Vegas is restricted in American Samoa, Andorra, Anguilla, Aruba, Barbados, Belgium, Bermuda, British Virgin Islands, Cayman Islands, Chile, Cook Islands, Greece, Iceland, Luxembourg, Marshall Islands, Martinique, Mayotte, Mexico, Monaco, Montserrat, New Caledonia, Niue, Northern Mariana Islands, Portugal, Puerto Rico, San Marino, Spain, Sweden, Tokelau, Uruguay and Venezuela countries. Captain Jacks terms state that you have to make a deposit between No Deposit Casino Bonuses to be qualified to make a withdraw. Take care you do not use multiple free promotions as they may not pay you for not following terms and conditions. Be sure you do not use more than one free bonus back to back at Wild Vegas as they may not pay you for not following the rules. Be sure when you use a no deposit bonus code from Slotastic as with most RTG run casinos, you are required to post a deposit between Free Casino Bonuses. Take care you do not use multiple free promotions back to back as they may not pay you for not following terms and conditions. American Samoa, Andorra, Anguilla, Argentina, Aruba, Barbados, Belgium, Bermuda, Cayman Islands, Chile, Cook Islands, Greece, Guam, Guyana, Iceland, Japan, Luxembourg, Marshall Islands, Martinique, Mayotte, Mexico, Monaco, Montserrat, New Caledonia, Niue, Norfolk Island, Northern Mariana Islands, Portugal, Puerto Rico, San Marino, South Africa, Spain, Swaziland, Sweden, Switzerland, Tokelau, United Kingdom, Uruguay and Venezuela countries are not able to play at Cool Cat Casino. Be sure you do not use more than one no deposit bonus back to back at Cherry Jackpot as your balance may be voided without making a deposit. Wild Vegas requires that you have to make a deposit between multiple no deposit bonuses to be qualified to process a withdraw. Do not use more than one no deposit bonus back to back at Captain Jacks as your balance could be removed without making a deposit. Be sure when you use a free Casino Bonus code from Fair Go as with most operated Online Casinos, you are required to make a qualifying deposit if the last casino bonus was also a free one. Fair Go is restricted in Bulgaria, Costa Rica, Denmark, Israel, Oman, Poland and Ukraine countries. Do not use multiple free Casino promotions as your winnings could be voided without making a deposit. Note that Bulgaria, Costa Rica, Denmark, Israel, Oman, Poland and Ukraine players are restricted at Fair Go Casino. Take care you do not use multiple no deposit bonuses at Captain Jacks as they may not pay you for not following the rules. Be sure when you use a no deposit bonus code from Captain Jacks casino as with most RTG powered casinos, you must post a qualifying deposit between no deposit Online Casino promotions. Wild Vegas terms state that you must make a qualifying deposit between multiple no deposit casino bonuses to be able to process a withdraw. 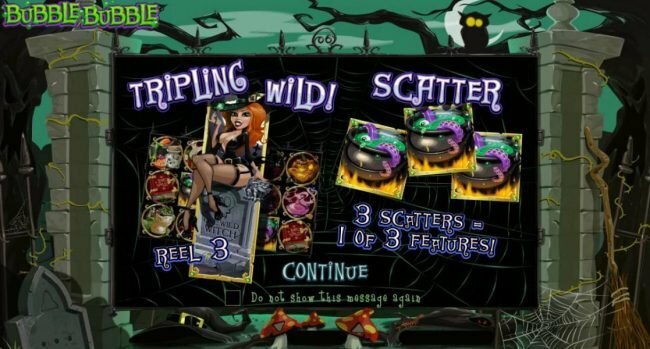 Wild Vegas requires that you must make a deposit between multiple Free Casino Bonuses to be able to make a withdraw. Note that American Samoa, Andorra, Anguilla, Aruba, Barbados, Belgium, Bermuda, British Virgin Islands, Cayman Islands, Chile, Cook Islands, Greece, Iceland, Luxembourg, Marshall Islands, Martinique, Mayotte, Mexico, Monaco, Montserrat, New Caledonia, Niue, Northern Mariana Islands, Portugal, Puerto Rico, San Marino, Spain, Sweden, Tokelau, Uruguay and Venezuela players are forbidden at Wild Vegas. Do not use multiple free Bonuses as your winnings could be voided without making a deposit. Take care you do not use multiple Free Casino Bonuses at Wild Vegas as your winnings could be voided without making a deposit. Wild Vegas casino is prohibited in American Samoa, Andorra, Anguilla, Aruba, Barbados, Belgium, Bermuda, British Virgin Islands, Cayman Islands, Chile, Cook Islands, Greece, Iceland, Luxembourg, Marshall Islands, Martinique, Mayotte, Mexico, Monaco, Montserrat, New Caledonia, Niue, Northern Mariana Islands, Portugal, Puerto Rico, San Marino, Spain, Sweden, Tokelau, Uruguay and Venezuela countries. Captain Jacks requires that you have to make a deposit between multiple Free Casino Bonuses to be qualified to make a cash out. Do not use multiple free Bonuses at Slotastic as your balance could be voided without a deposit. Be sure when you use a free Casino Bonus code from Captain Jacks casino as you know with RTG powered casinos, you have to post a qualifying deposit between no deposit Online Casino Bonuses. Do not use multiple No Deposit Casino promotions back to back as they may not pay you for violating terms and conditions. Wild Vegas is prohibited in American Samoa, Andorra, Anguilla, Aruba, Barbados, Belgium, Bermuda, British Virgin Islands, Cayman Islands, Chile, Cook Islands, Greece, Iceland, Luxembourg, Marshall Islands, Martinique, Mayotte, Mexico, Monaco, Montserrat, New Caledonia, Niue, Northern Mariana Islands, Portugal, Puerto Rico, San Marino, Spain, Sweden, Tokelau, Uruguay and Venezuela locations. Do not use more than one no deposit promotion back to back at Wild Vegas as your winnings may be voided without a deposit. Captain Jacks requires that you must make a qualifying deposit between Free Casino Bonuses to be allowed to process a withdraw. Take care you do not use more than one no deposit bonus as they may not pay you for not following terms and conditions. Planet 7 terms state that you must make a qualifying deposit between multiple Free Casino Bonuses to be able to process a cash out. American Samoa, Andorra, Anguilla, Argentina, Aruba, Australia, Austria, Barbados, Belgium, Bermuda, British Virgin Islands, Cayman Islands, Chile, Cook Islands, Finland, Germany, Greece, Guam, Iceland, Japan, Luxembourg, Marshall Islands, Martinique, Mayotte, Mexico, Monaco, Montserrat, New Caledonia, New Zealand, Niue, Norfolk Island, Northern Mariana Islands, Norway, San Marino, South Africa, Spain, Sweden, Switzerland, Tokelau, United Kingdom, United States and Venezuela countries are restricted at Planet 7 casino. Be sure when you use a free Casino Bonus code from Cherry Gold as you know with operated casinos, you must make a deposit between free casino promotions. Slotastic terms state that you have to make a deposit between multiple no deposit casino bonuses to be allowed to make a cash out. 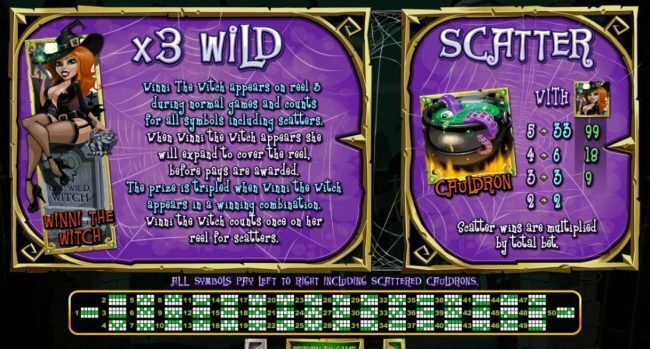 Wild Vegas requires that you have to make a deposit between multiple no deposit bonuses to be able to make a cash out. Do not use multiple no deposit casino bonuses at Captain Jacks as they may not pay you for not following terms and conditions. Be sure when you use a no deposit bonus code from Wild Vegas as you know with RTG run Online Casinos, you must post a deposit between free Online Casino promotions. Be sure you do not use more than one No Deposit Casino bonus at Captain Jacks as your winnings may be removed without making a deposit. Take care you do not use multiple No Deposit Casino promotions as they may not pay you for not following the rules. Do not use more than one no deposit Casino promotion as your balance could be voided without making a deposit. Fair Go Casino is prohibited in Bulgaria, Costa Rica, Denmark, Israel, Oman, Poland and Ukraine countries. Do not use multiple no deposit bonuses back to back as they may not pay you for violating the rules. Be sure you do not use multiple No Deposit Casino promotions back to back at Sloto Cash as they may not pay you for not following the rules. 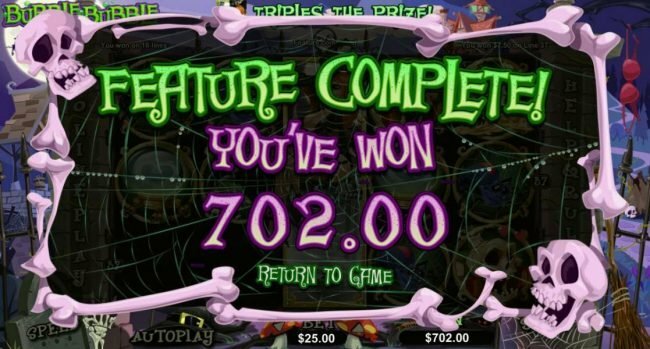 Be sure when you use a No Deposit Casino bonus code from Wild Vegas as with most RTG run Online Casinos, you must post a deposit if your last Casino Bonus was also a no deposit one. Wild Vegas is restricted in American Samoa, Andorra, Anguilla, Aruba, Barbados, Belgium, Bermuda, British Virgin Islands, Cayman Islands, Chile, Cook Islands, Greece, Iceland, Luxembourg, Marshall Islands, Martinique, Mayotte, Mexico, Monaco, Montserrat, New Caledonia, Niue, Northern Mariana Islands, Portugal, Puerto Rico, San Marino, Spain, Sweden, Tokelau, Uruguay and Venezuela locations. Do not use multiple no deposit promotions at Captain Jacks as they may not pay you for not following terms. Be sure when you use a No Deposit Casino bonus code from Slotastic as you know with RTG run casinos, you are required to make a deposit if your last bonus was also a no deposit one. Be sure when you use a no deposit bonus code from Wild Vegas as with most RTG run Online Casinos, you must make a qualifying deposit between free Online Casino promotions. American Samoa, Andorra, Anguilla, Aruba, Barbados, Belgium, Bermuda, British Virgin Islands, Cayman Islands, Chile, Cook Islands, Greece, Iceland, Luxembourg, Marshall Islands, Martinique, Mayotte, Mexico, Monaco, Montserrat, New Caledonia, Niue, Northern Mariana Islands, Portugal, Puerto Rico, San Marino, Spain, Sweden, Tokelau, Uruguay and Venezuela locations are restricted at Wild Vegas. 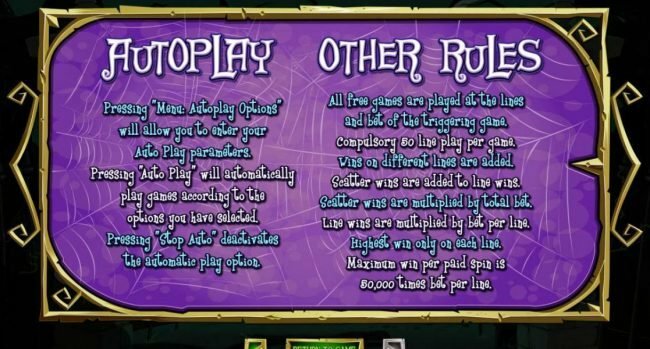 Do not use multiple Free Casino Bonuses at Slotastic as they may not pay you for not following terms and conditions. Be sure when you use a no deposit bonus code from Wild Vegas casino as you know with RTG operated Online Casinos, you have to make a qualifying deposit if your last Bonus was a free one. American Samoa, Andorra, Anguilla, Aruba, Barbados, Belgium, Bermuda, British Virgin Islands, Cayman Islands, Chile, Cook Islands, Greece, Iceland, Luxembourg, Marshall Islands, Martinique, Mayotte, Mexico, Monaco, Montserrat, New Caledonia, Niue, Northern Mariana Islands, Portugal, Puerto Rico, San Marino, Spain, Sweden, Tokelau, Uruguay and Venezuela locations are restricted at Wild Vegas Casino. Be sure when you use a free Bonus code from Captain Jacks as with most RTG powered casinos, you must make a qualifying deposit if the last Casino Bonus was a no deposit one. iNET Bet requires that you must make a qualifying deposit between multiple no deposit casino bonuses to be able to process a withdraw. Afghanistan, Albania, Armenia, Azerbaijan, Belarus, Bosnia and Herzegovina, Bulgaria, Costa Rica, Croatia, Czech Republic, Denmark, Estonia, France, Hungary, Indonesia, Iran, Iraq, Latvia, Lithuania, Malaysia, Moldova, Montenegro, Pakistan, Romania, Serbia, Slovenia, Turkey, Ukraine and Zimbabwe countries are forbidden at iNET Bet Casino. Be sure when you use a no deposit bonus code from Wild Vegas as with most RTG run casinos, you have to post a deposit between Free Casino Bonuses. Captain Jacks requires that you must make a qualifying deposit between no deposit bonuses to be qualified to process a withdraw. Do not use more than one free Bonus as they may not pay you for violating terms. Be sure when you use a free Bonus code from Uptown Aces Casino as you know with RTG run casinos, you are required to post a deposit if the last Casino Bonus was a free one. Captain Jacks requires that you have to make a qualifying deposit between free Bonuses to be allowed to process a cash out. Be sure you do not use more than one free Casino Bonus back to back at Wild Vegas as your balance may be voided without a deposit. Be sure when you use a free Casino Bonus code from Captain Jacks as with most RTG operated casinos, you must make a qualifying deposit between No Deposit Casino promotions. Cool Cat terms state that you have to make a qualifying deposit between free Bonuses to be qualified to make a cash out. Do not use multiple No Deposit Casino promotions back to back as they may not pay you for not following terms. Be sure you do not use multiple no deposit bonuses at Captain Jacks as your balance may be voided without a deposit.